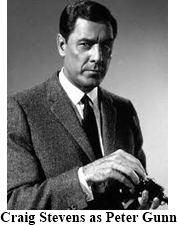 This show was the first “private eye” show to break the Sam Spade, Philip Marlowe mold of what a private detective should look and act like. 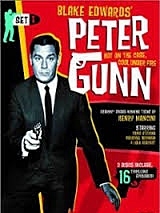 Peter Gunn (Craig Stevens) was cool, sophisticated, urbane, well groomed and polished. He preferred cool jazz, old scotch, expensive suits and beautiful women. 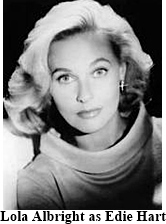 His love interest was the singer Edie Hart (Lola Albright)at his favorite jazz club, Mother’s. 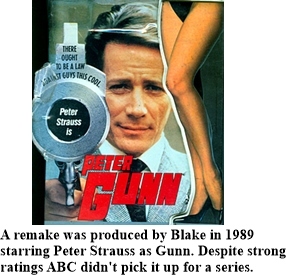 She eventually gets her own bar but she remains Gunn’s gal throughout the series. Gunn had his circle of confidants who would provide him with information which would eventually lead to solving the case. 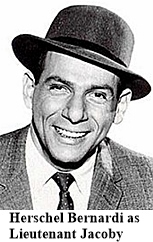 Lieutenant Jacoby (Herschel Bernardi)was his best source for information and new clients. Being a police officer Jacoby’s hands were often tied by police procedure so he counted on Gunn to work outside of the rules to help the victims of whatever dastardly deed had befallen them. Billy Barty played pool hustler Babby and Herbert Ellis portrayed Beat a bistro owner, they both appeared in several episodes as informants. Another source of “underground” information was Mother, owner of the jazz club where Edie Hart sang. 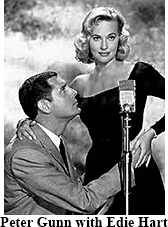 The character was originally played by Hope Emerson but due to failing health she was replaced after the first season. Minerva Urecal took over the role in subsequent seasons. Williams has won 5 Academy Awards with 48 Academy Award nominations, 4 Golden Globe Awards, and 21 Grammy Awards.